When designing landscapes, the frequency and direction of strong winds is an important factor for consideration so that effective windbreaks can be set up where necessary. These windbreaks can be constructed, such as including a trellis in your plans, or natural by means of the plants you select. In order to effectively assess what windbreaks would suit your project it is essential to analyse the site you are working on. The existing elements on the property as well as the size of the space will factor into both the wind you are dealing with and your options of countering it. “A windbreak creates what is essentially a micro-environment in your garden to allow the more tender plants to establish,” said Tessa de Wet of Plants on 6th Nursery in Melkbosstrand. “It also protects the garden from salt damage, if you live near the ocean, and can act as a privacy screen if correctly placed.” In addition, windbreaks can protect against the drying effect of wind on the leaves of other plants. The need for wind protection is usually pressing and, as such, the size of the plants used as well as their rate of growth is one to consider. It is a good idea to make use of trees that are feathered and bottom heavy or multi stemmed as these generally withstand the conditions better than those that are top heavy. Don’t forget that planting trees close together for the purpose of wind protection may give you issues down the line once they mature! Where possible, windbreaks should be placed perpendicular to the prevailing wind. Where wind directions change, L, U and E shaped breaks are a popular choice. A factor not to be overlooked is that any gaps in your design will see the wind concentrated into those spaces, forming wind tunnels. 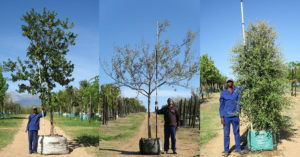 We are fortunate enough to have a range of fantastic windbreak species in South Africa. Two such species we would recommend for this purpose are Brachylaena discolor (Silver Oak) and Tarchonanthus camphoratus (Camphor Bush). While these trees can be mistaken for each other, their distinct difference can be seen in the silver underleaf of the Brachylaena as opposed to the uniform colouring of the Tarchonanthus leaves. If you’re working in a smaller space they can be the ideal option as they don’t traditionally grow into very large specimens. If space is not an issue in your design, a small cluster of Sideroxylon inerme (Milkwood) can do an amazing job at dissipating winds while at the same time creating a brilliant tree undercover.